Why are Pool Tables so Heavy? Most pool table have a thick slate playing surface covered in felt. Slate is traditional and balls just seem to perform better with a slate table. They also are more stable and last a very long time. Q: How hard is it to re-felt the table yourself? 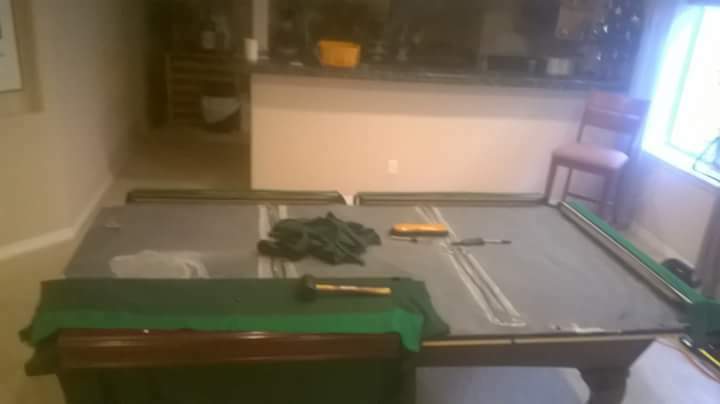 A: It is harder than it looks to re-felt your own pool table. There are a series of specific stretches and angles needed for securing the most efficient and tight playing surface. Q: Will the pool table I just bought fit in my room? 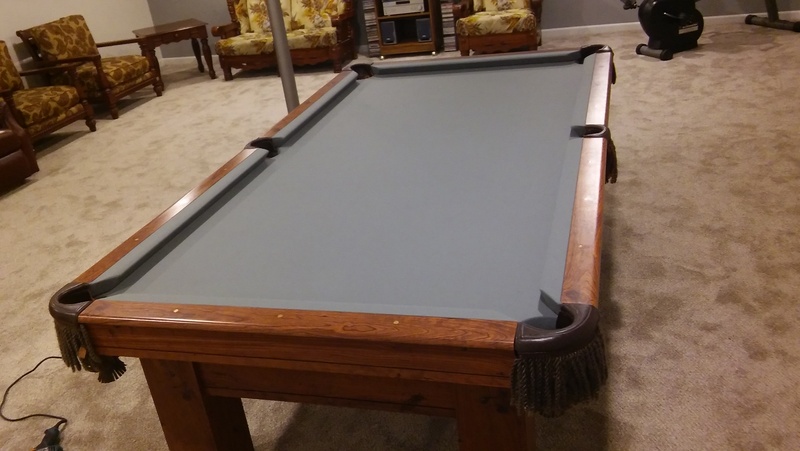 A: Making sure your pool table is properly measured from all angles of the room can be a difficult task, our professionally trained staff will make sure your pool table you just bought or want moved from one room to another fits the dimensions of the room to your liking. Note: Standard length from each corner of the table should be 58" for a 3 inch drawback on your pool cue. Q: How much does a pool table weigh? 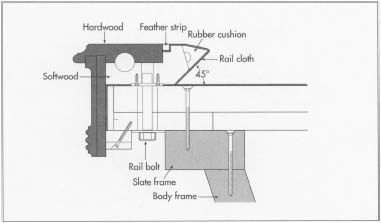 A: A typical 8’ slate pool table weighs about 750-850 pounds. Q: What is a standard size pool table? Q: Can I move my table without disassembling it? 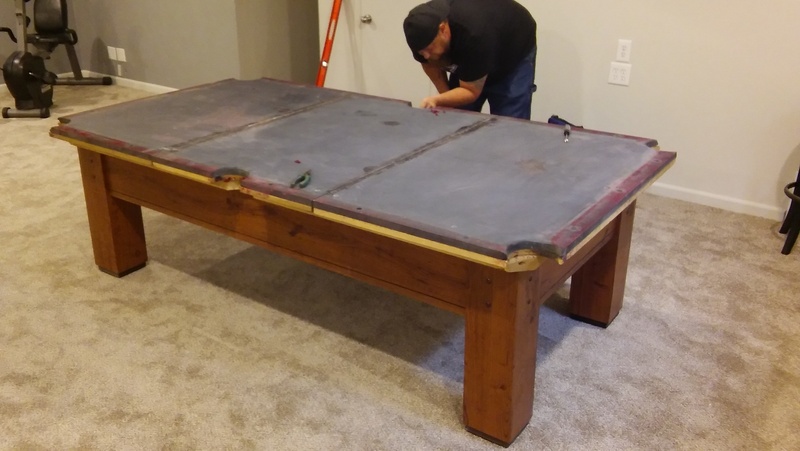 A: We would NEVER recommend moving a pool table without breaking it down. Not only is it dangerous for you but can easily damage your slate or frame. 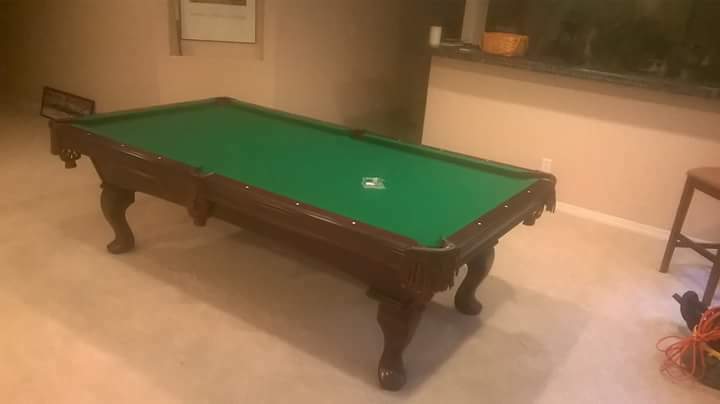 Coin operated pool tables are the only pool table you can get away with moving as a whole but are very heavy and easy to damage as well. Q: Can I put my pool table up stairs or down in my basement? A: You sure can although there is an additional fee per flight of stairs but we can absolutely get it up or down there! Q: How long do your services take? A: Set up a new table - 1.5-2 hours. Move a table one house to another - 3 hours not including travel time. Re felt a pool table - around 2 hours.